Here are some of the areas of debate that emerged after yesterday’s clash in Croke Park. Colm McFadden celebrating after yesterday's game. Amidst all the forensic analysis that will be applied to this game, the stark truth is that it was settled on the scoreboard at an early juncture. By the 12th minute Donegal had surged into a 2-1 to 0-0 lead after Michael Murphy’s furious blast to the net and Colm McFadden’s clinical finish past David Clarke. That scoring return had the twin effect of energizing them and deflating Mayo. For the rest of the game Mayo did outscore Donegal by 0-13 to 0-10 but the damage had been done. Donegal always had that scoreboard cushion to rely on and once again they illustrated how adept they are at protecting leads when they construct them. Donegal’s defensive virtues have been well-flagged but it was clear after last year’s All-Ireland semi-final loss to Dublin that they needed to add some attacking strings to their bow. They showed throughout 2012 how they had embraced a great offensive philosophy and that was maintained yesterday on the biggest stage of all. For all of the wonderful endeavour of Frank McGlynn, Karl Lacey, Anthony Thompson, Rory Kavanagh and Mark McHugh, it was the input of their scoring stars that was critical. Donegal’s twin threat of Michael Murphy and Colm McFadden proved lethal as they claimed 1-4 apiece. Murphy has sacrificed himself for the greater good of the team in recent times but yesterday he was stationed in his established role at full-forward. He rocketed home a goal for the ages to set his team on the road early on and then strode outfield to kick momentous frees in the second-half, particularly his brilliant effort in the 55th minute after Mayo had registered three consecutive points. McFadden clinched the top scorer award for 2012 as he brought his overall return to 4-32, 2-12 from play, for the season. His opportunism was on show for that first-half goal and he also notched superb points, with his effort just before the interval a priceless score under pressure following a Mayo scoring spree. In contrast Mayo experienced problems up front. After the devastating concession of those early goals, they needed to wreak havoc in attack if they were to peg back Donegal. Instead it took them 15 minutes to hit their first point of the game, they did not register their first point from play of the second-half until the 64th minute, none of their starting forwards scored from play in the second-half and three of that sextet were withdrawn by the finish. To their credit Mayo’s forwards, particularly Michael Conroy and Enda Varley, worked furiously to get back into the game before half-time. And the points from play that Conroy, Varley and Kevin McLoughlin hit in the opening half were exceptional. Yet after the break when they could have got a grip of the game, the flurry of necessary scores never materialised. There was a lack of composure in instances as chances were snatched at while the failure to claim primary possession from deliveries close to goal on a regular basis also affected them. That trait magnified the loss of their talismanic captain Andy Moran while Donegal managing to blot out the threat of Alan Dillon was also significant. On one hand there was not too much surprising about Donegal’s success yesterday given the fabulous form they had displayed this summer and the heavy mantle of favoritism that they held entering the game. But step back and consider once more their transformation in recent years, and it leads to the realisation that their achievement is staggering. Of the 19 players that played some part in yesterday’s game, nine of them featured when Donegal were thrashed by Cork in the 2009 All-Ireland quarter-final and 14 of them lined out when they were humbled by Armagh in the qualifiers a year later. The transformation since then under the guidance of Jim McGuinness and Rory Gallagher has been breathtaking. Their physical conditioning, their tactical nous and their football mentality are all now supreme. It has taken much painstaking effort but the rapid metamorphosis from a bedraggled force to the champions of the land in just over two years has been stunning. The Mayo supporters left Croke Park yesterday evening with that familiar sense of September anguish. But as they trailed back west after falling short for the sixth time in 23 years on All-Ireland senior final day, they could still find solace in the defeat. Unlike the massacres they suffered in the past, Mayo never capitulated here even when a drubbing looked possible after Donegal’s whirlwind start. Instead they fought back from the moment that David Clarke smartly blocked Colm McFadden’s attempt for a third first-half goal. The wing-back pairing of Lee Keegan and Colm Boyle were absolutely magnificent while Aidan O’Shea, Enda Varley and Michael Conroy shone brightly at stages. Even Kevin Keane, who endured a nightmare start to the game, rose to the challenge in the second-half and gamely battled in defence. They have the nucleus of a side that can challenge for honours with strong players and an excellent management setup. The coming weeks will be a tough time for James Horan’s men coming to terms with this loss yet they showed yesterday that they have the backbone to compete in the future. 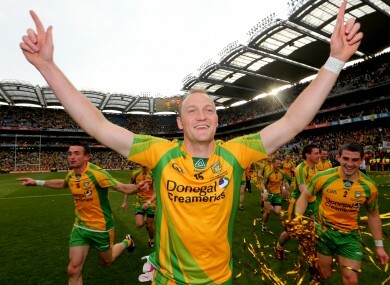 Email “Talking Points: Donegal 2-11 Mayo 0-13, All-Ireland SFC final”. Feedback on “Talking Points: Donegal 2-11 Mayo 0-13, All-Ireland SFC final”.